Nick tells Shane that Maria is lonely and needs company. He tells Shane he won't go until Maria tells him to. Des pushes Greg over for being rubbish at his job and blaming him. Shane tells Maria that he thinks Nick is trying to crack on to him. He asks Maria if she had an affair with Nick when she left Max when he was young. Maria tells Shane calmly that she didn't. Shane thinks that something has happened between them before and Maria explains that Nick liked her in school, but Maria married Max. Maria tells Shane that Nick is nothing to do with her and Max splitting up. Shane thinks he could get in the way of them getting back together. But Maria says she still loves Max and wants him back. SHANE: You think he will come back? Shane says Maria had better start thinking about what Nick's position is in all this. Des come in with a bleeding nose, much to Daphne's dismay. He explains that Greg hit him but that he, Des, started it. He explains about the credit analysis. Daphne thinks Des did well to push Greg over! She wants Des to have his nose checked out though. DES: If it's broken, I'll kill him! Lucy comes late looking very fed up. She's been to her friend's house. She starts to cry and tells Jim that something terrible has happened. Lucy explains to Jim that she saw a dog run over in Bedford Street. Only Lucy saw. LUCY: What if it's still alive? JIM: Do you think it might be? LUCY: I don't know. Daddy, will you go and have a look? Jim heads off to have a look while Helen comforts Lucy. 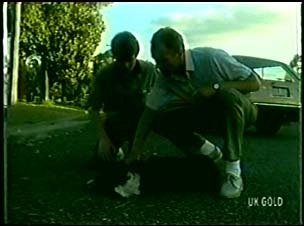 Jim and Scott have found the dog - he's still alive. They wrap the dog in blanket and put him in the car. Julie storms in to talk to Des. She rants that Greg's lip is swollen and he won't be able to show his face in the bank for days. Daphne tells Julie that Des's nose is broken, and indeed, he has a large white sticking-plaster across his face. Julie is concerned and fusses over Des. JULIE: Shouldn't you be in hospital? Des tells Julie that the doctor said he'd have a crooked nose for the rest of his life(!) Daphne continues the wind-up saying Des could always have plastic surgery later. Des says he could never afford plastic surgery. Julie says that Des started it, but Des says it was worth it! Julie gets mad again and says that Des hasn't given Greg a chance since he first arrived. Des tells her exactly what he thinks. She storms out. JULIE: I'll see you at work! DES: Yeah, I'll be in to get my severance pay! Daphne asks Des if he really thinks he'll get the sack over this. Des doesn't know, but he might. DES: Do you know what I'll really, really, really miss about work? Jim and Scott are in the vet's waiting room. The vet is surprised to see Jim - he thought he'd finished with pets! The vet tells Jim that the dog is concussed and has a broken leg. The dog is old - the vet could save him, but he's not sure it's worth it. Lucy arrives and is very upset that they want to put the dog down. LUCY: How would you like it if you were old and just because you had a broken leg, they wanted to kill you? She's got a point! Jim says it's different with dogs and the vet knows best. Lucy says they could take him home, but Jim says no. Lucy starts to cry and walks out of the waiting room. JIM: All right. Save the stupid thing. Des is re-enacting the fight with Greg to Daphne and Shane. He then heads off to bed. DES: If I stop snoring, it means I've stopped breathing. SHANE: We'll keep an ear out, mate. Daphne and Shane chat on the sofa. He tells her that things are not the best at home. He's worried about Max living in a dump. 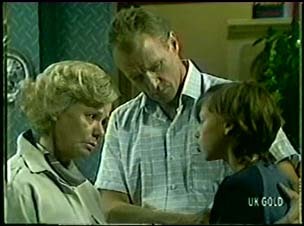 Daphne tells Shane not to push his parents. He just wishes he knew the reason they'd split up - he thought it was Nick Berman, but it isn't. He says Maria is OK, but he can't help but blame her for what's happened. He keeps going off the deep end. Daphne tells Shane she might be moving on soon. SHANE: You can't leave Ramsay Street. Even if it is just to spite my Dad! Daphne wants to know if Shane likes her. Shane says it's tempting, it really is, but he's holding off because he likes her. Right now he needs friends. He gives her a hug. Everyone is having breakfast. Lucy has called the dog Robert. 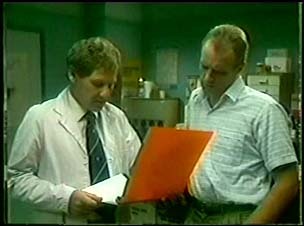 Jim goes to ring the vet to see how Robert is getting on. SCOTT: It's just a dog Lucy, and a mangy one at that. LUCY: He's not mangy. He's a pure-bred mongrel! Jim rings up about Robert. The vet tells him that the dog is going to be fine. But Jim says they can't go and get him - he must belong to someone. Jim doesn't want another dog - too many hearts get broken when things go wrong. Lucy is upset and stalks off. JIM:(to Helen) It's easy for them! They don't have to bury the little blighters! 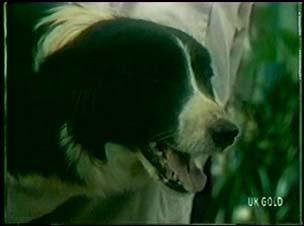 Helen says the girls think Jim had the previous dog, Digby, put down because he dug up the garden! In the living room, Julie tries to comfort Lucy. But she says they have to respect Jim's decision. JIM:(coming in from the kitchen) Julie. Do me a favour, please, would you. Go up the vet and pick up the dog. Lucy is delighted and hugs Julie tightly! Julie and Lucy are talking to the vet about the care of the dog. He carries the dog out to the car for them. Julie isn't pleased to see that the dog is ancient and stinky. Lucy says that the dog can't walk home! Julie has to relent. Maria is looking for some letters she wrote. To her surprise, Shane says he's posted them. Maria is also pleased to see that Shane has set out the breakfast for them. Max comes in through the back door. He's had his sling off and his arm is much better. He has to go to court about the drink driving charge today though. He's come to get his suit. Shane goes off to get it. Maria tells Max that he still has a few things at the house. She offers him a coffee and says that Max should have told her about the court case. She offers to go, but Max says there's no need - drink driving is pretty straight forward. Shane offers to come as well, but Max declines. He heads off. Lucy is stroking the dog in the kitchen. Julie is not pleased, saying the dog is unhygienic. Max comes round and Lucy shows him her new dog. They tell him the story. Jim says he's going to look for the owner. But Max says he thinks he knows the owner - he did a job for an old guy in Bedford Street - he reckons it's his dog.